The New England College of Business and Finance online is a fully online school, originally known as the American Banking Institute. 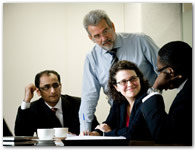 It offers programs in business and finance at the undergraduate and graduate level, all geared toward working adults. NECB's online learning environment brings students the skills and knowledge they'll need to become successful in the 21st century workplace. Students have access to free online tutoring support and an "Ask a Librarian" support portal that is available 24/7, 365 days a year. Two research and library skills courses are available to both undergrad and graduate students to enhance their virtual learning experience. NECB students are encouraged to use the online discussion boards to foster valuable relationships with faculty and other students and the social media site LinkedIn to make other valuable connections. Teachers at NECB are not just professors. They're executive-level business practitioners, program administrators and business leaders who provide detail-oriented instruction and insight. In 2013, the college was named the most affordable private college in New England by the U.S. Department of Education. The college has developed corporate partnerships that provide tuition discounts for employees and their families who participate in NECB's online programs. New England College of Business and Finance (NECB) is accredited by the New England Association of Schools and Colleges (NEASC) and licensed by the Massachusetts Department of Higher Education. Format is online using state-of the-art delivery. Courses are in the new technology Canvas platform. International online students are welcome. Note that the NECB does not issue I-20's. A College representative will contact and walk you through the application process. I wouldn’t have had the required skills for my new role without my education. Every day I use the communication and leadership skills that I acquired at NECB.